Phone number 8-771-271-95-95, e-mail: sattarovags@mail.ru. 2001-2003 y. – taking postgraduate studies. Dissertation by the specialty 05.26.01 “Labor protection” was defended in examining committee at the Institute of Mining named after D. Kunayev in Almaty. Doctor of technical science. 2001-2003 – studying full-time postgraduate studies on Mining aerology and Occupational Safety department of Karaganda State Technical University by the specialty 05.26.01 “Labor protection”. During this time, theoretical and practical researches on the topic of the dissertation were conducted. June 2010 – invited to the “NSTCIS” JSC branch of KSRIIP MID RK as Head of the sector “Monitoring of Emergency Situations and Rescue”. Transferred to the position of head of the sector “Research and risk assessment” in August 2010. Transferred to the post of leading researcher at the “Engineering Protection and Risk Management” Research Laboratory in January 2011. Transferred to the post of head the “Engineering Protection and Risk Management” Research Laboratory in April 2011. 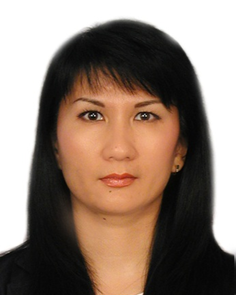 Main research interests: industrial safety, labor protection, risk management system. 7. Risk assessment of the occurrence and development of accidents on the example of thermal power plants. Materials of the XII International scientific and practical conference, «Areas оf sciеntific thought»,- 2015/2016, 52-56 p., (so-authors: E. Komleva, M. Baituganova, M. Kakenova, N. Zholmagambetov). Other responsibilities: responsible for the planning and distribution of the teaching load of teaching staff of the department, responsible for academic mobility of students.